When it comes to managing and maintaining a website, this is arguably the most important factor. Websites need constant monitoring and updating to ensure maximum performance and security. Our systems are constantly scanning your site for vulnerabilities and our advanced tech team applies the necessary updates. We create numerous daily back ups of your site and we store them securely in the cloud for maximum security. This allows for a quick restoration in case something goes wrong. We run constant 24/7 monitoring of our client’s sites to ensure their site is up and running. When it goes down, our support team is immediately notified so we can fix the problem and keep your site live. Almost every website faces a barrage of attacks everyday. We run extremely advanced and automated security checks using state of the art systems to make sure your site is protected. We keep a close eye on how your website is performing so that if problems arise, they can be addressed quickly and effectively to ensure the best experience for your visitors. Keep tabs on how your website is performing for relevant keywords in your market. 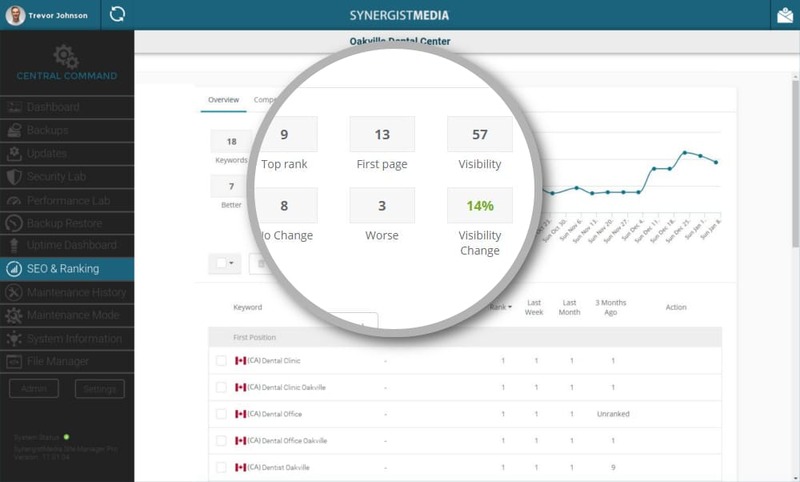 You can also see who your competitors are and how well your site performs against them. Not only does having an SSL certificate make your visitors feel safe and boost your credibility in their eyes, Google is now penalizing a website’s search ranking if they do not have one. An SSL certificate enables an encrypted connection between your site and your visitors. It’s basically the same as sending a letter through the mail in an envelope. Not having an SSL certificate would be like sending that same letter through the mail without an envelope; open to anyone to see. Visitors don’t like that very much. Host your site with us and we’ll install and configure an SSL certificate with 256 bit encryption at no extra charge! You want performance? We deliver performance! Sites that are hosted on our Professional and above plans are hosted on best in class cloud based managed hosting environments. Improve your page load times by 500%. Our hosting environment leverages a potent combination of web server and cache technologies which gives you exceptionally fast managed cloud hosting. A powerful service that delivers superior performance and top-of-the-chart global response times. We run all of our hosted sites on our Professional plan and above on our powerful Content Delivery Network (CDN). SSD technology can provide for a 1000x increase in input/output compared to regular drives. All files and databases hosted on our Professional Hosting Plan and above leverage SSD storage. We offer unmetered data transfer on our Professional Hosting Package. This means that you can have almost any type of website and scale it to suite your needs. We install state of the art caching software that drastically boosts loading speeds and the number of hits a site can take without degrading performance. The PCI DDS (Payment Card Industry Data Security Standard) is a security initiative aimed at safeguarding credit card holder information, preventing credit card fraud and other security threats and vulnerabilities. Our Business & Enterprise hosting plans are entirely PCI compliant and offer a safe and stable environment for online merchants and their businesses. Our premium back up service, included for free in applicable plans, allows access to the latest 30 backup copies of your website with the automatic back up restore tool, but also includes unlimited free professional restores by our support team. *Basic updates includes the installation and configuration of software updates. Sometimes these updates can cause programmatic conflicts and cause a site to go down. If this happens and we need to make repairs, clients under the Standard Website Monitoring, Maintenance & Security plan will be billed at $40 for our tech support team to resolve the problem. *Advanced updates under the Business Website Monitoring, Maintenance & Security plan includes 5 hours per month dedicated toward fixing conflicts and errors that may occur during updates. If a customer's site under this plan requires more than 5 hours in a billing month, they will be billed at $40 per hour. 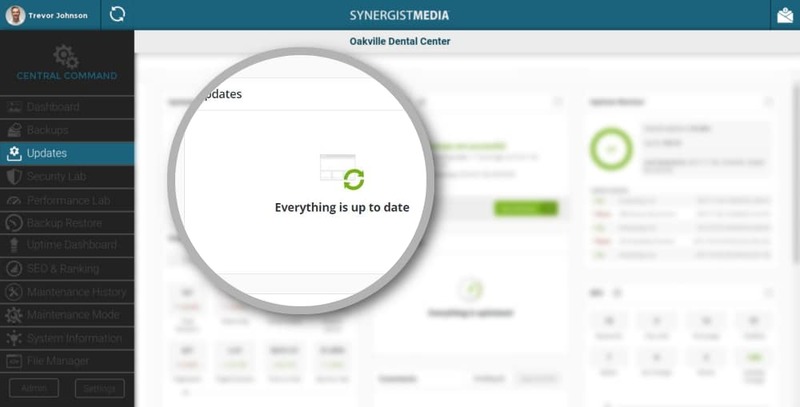 *Advanced updates under the Enterprise Website Monitoring, Maintenance & Security plan includes 10 hours per month dedicated toward fixing conflicts and errors that may occur during updates. If a customer's site under this plan requires more than 10 hours in a billing month, they will be billed at $40 per hour. The aforementioned hours are not available for additional design and development work.